We've got a feast of tries for you today with the best from the Top 14 being posted now, and then the regular Super 14 Pick of the Week coming up a little later. 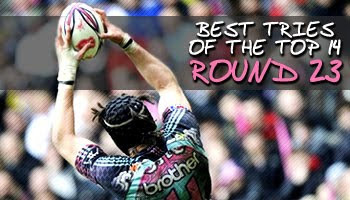 First though, the best tries from round 23 of the French domestic competition. Compared to the normal high standard, the tries in this round probably weren't all that great unfortunately. There were a few out of the top drawer though, including England's James Haskell's chip and chase effort for Stade Francais against Perpignan. Jamie Noon also scored a great try, but his was more of a finish from an excellent attack by Brive against Racing Metro. Highlights from that match can be seen here. Argentinean fans will be happy to see that Felipe Contepomi crossed for Toulon against Bourgoin, the same match where we saw Tana Umaga comeback and make two great hits. Toulouse scored through Maxime Medard against Biarritz, and this try comes in at number one on the list according to the station that made the compilation. Enjoy the variety of tries and you decide who you think should have been at number one. Haskell, and Andreux's work are the best for me. A blind side flanker chipping & chasing, then scoring from it has to be the best. Haskell all the way. North v South club game is getting alot of press in the south, thoughts? Some great tries but some big defensive mistakes too, especially from Stade Français. Great inspiration by Haskell ! I hope Brock James will be at his best level against Leinster friday. Can't wait for this match. Also, LOVE the French commentary, as always. On Medard's try the commentator was going a mile a minute, accidentally called David Lambole, corrected himself, then went back to rapid-fire french commentating at it's finest. thoroughly enjoyed this clip. Some defensive errors, but none of the weak tackling that we sometimes see in these clips. Most of these tries came from great support play, running superb lines and fantastic hands. Great play on the haskell try by whoever switches attack to the other side of the field perpignan have a well organised line and moving it away takes at least 6 of them out of the game. Good clip!